This is another late viewing of a local show due to my week-long NYC trip. 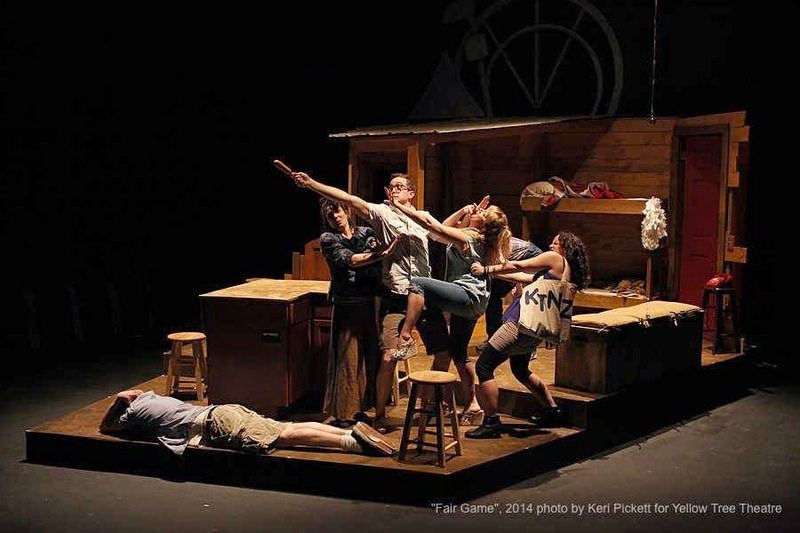 Unfortunately Yellow Tree Theatre's new original play Fair Game (written by Theater for the Thirsty's Jeremiah Gamble) closes this weekend, but if you happen to be free and are looking for a cute, fun, and very Minnesota play, this is the one for you! There's nothing too deep or thought-provoking about this story of a fictional reality show that puts five Minnesotans in an ice house for the duration of the State Fair, but it's clever and entertaining with a great small cast that is obviously having as much fun as the audience. The play begins with a voiceover, in which we learn about the five contestants of Fair Game, a radio and online reality show which awards $50,000 to the person with the most tickets by the end of their stay in the small but cozy ice house (this is not nearly enough money to get me to spend twelve days trapped in a small space with four strangers!). There's tough-talking working class Desi from a small town outstate (Bonni Allen, with a perfect rural Minnesota accent), her high school frenemy Brenda, a yogi from the suburbs whose life is not as perfect as it seems (Vanessa Gamble, bringing some heart and soul to the comedy), Rea, a spoiled teenager from Edina (the delightful Tara Borman), Zander, a thoughtful post-grad whose grand ideas of making the world a better place are put to the test (Nathan Cousins, transforming from sweet and sincere to ruthless and fed up), and typical Minnesota farmer Elden, who needs the money to care for his sick wife (an appropriately grumpy Peter Simmons). As in most reality shows, personalities clash and alliances form as the five compete in various tests for prizes and more of the coveted tickets, which must be spent for bathroom privileges, food, and water. Contestants scam, scheme, argue, and have heartfelt conversations. Not much else happens, and things are wrapped up a little too neatly at the end. But I was happy to spend a few hours with these quirky characters well-portrayed by the cast under the direction Kurt Schweickhardt, making his directing debut after starring in last year's excellent Circle Mirror Transformation. In fact I see some similarities between that play and this; both feature five people forced to spend time together, during which much is brought to light about their lives and relationships. As always, Yellow Tree makes the most of their small performance space. Scenic Designer Katie Phillips has created a darling little ice house with bunks, bench, table, and biffy with walls that the audience (although not the characters) can see through. I would happily spend twelve days in this tight little cabin (although without the annoying reality show contestants). The cast fills out this space well, and during a clever montage of freeze-frame scenes (like the one pictured here), we witness the passage of time and some of the silly tests and prizes (a corn dog!). As I'm sure is obvious, I'm a big fan of Yellow Tree Theatre and the community that its founders Jessica and Jason Peterson have created in a strip mall in Osseo. They make smart choices in plays, balancing more traditional works with plays that challenge their audience and new works such as this, many of which highlight our beloved state of Minnesota. If you can't make it to Osseo this weekend, don't worry, you'll have another chance to experience their unique brand of theater with The 39 Steps, opening at the end of the month. I've seen it a few times, and called it "a wild, zany, fun ride." Another great choice, and I can't wait to see what they do with it!